These Greek Seafood Recipes will help you re-live your holiday. Because Greece is made up of many islands it has a huge coastline and fish is plentiful and varied. Recipes are heavily tomato and olive oil based. Much like all Mediterranean cookery, it is a very healthy diet with meat playing a lesser part in meals and vegetables and herbs making local cuisine very tasty. 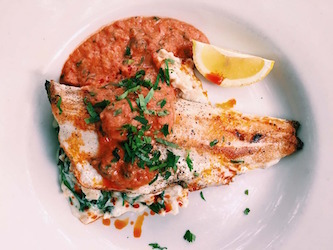 Fish features heavily in Greek cooking and the two recipes below are typically Greek - they are adapatable to the fish you will find in your local stores - most white non oily fish will do. A Mediterranean diet is normally accepted as 'healthy' - it's low on meat and high on fish and vegetables. Even when they do eat meat, it's normally served in a sauce which might have a half pound of meat to serve four people - can you imagine putting a 2 ounce steak on someone's plate! Heat some oil in a pan and fry the onion and garlic until softened. Add the chopped tomatoes, wine and pepper. Simmer until thickened - about 15 minutes. Arrange the fish in a single layer in an ovenproof dish - season with salt and pepper, sprinkle over the lemon juice. 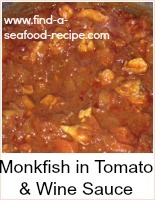 Pour the sauce over the fish and arrange the sliced tomato on top. Bake uncovered until the fish is cooked - about 20 to 30 minutes, depending on the thickness of the fillet. 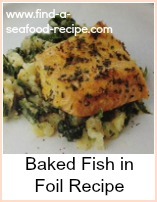 Garnish with parsley and serve with rice or crusty bread and salad. Add the wine, tomatoes, courgettes, tomato puree (black olives if you're using them) and marjoram and simmer for about 15 minutes until the sauce is thickened. 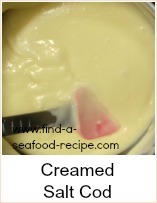 Place the cod steaks in a buttered ovenproof dish and pour the sauce over. Bake in the oven for about 30 minutes until the cod is cooked. Relive your Mediterranean holiday with these gorgeous Greek Seafood recipes.